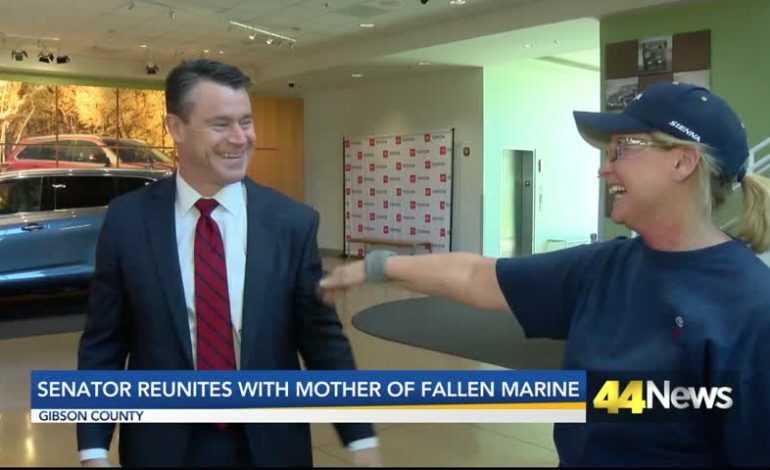 The 44News exclusive coverage of a Gold Star military mother’s special connection with her senator continued with a joyful reunion. At this year’s State of the Union address, Indiana Senator Todd Young gave President Trump a bracelet from Tri-State Marine mom Sandy Terwiske, whose son Lance Corporal Alec Terwiske died in Afghanistan. Now Sandy has had a chance to thank the senator for that gesture face-to-face. That emotional reunion happened where the Gold Star mother works, at the Toyota plant near Princeton, Indiana. During an average day the plant brings together steel, plastic and rubber – but that visit from the senator brought together two Hoosiers who have united in sacrifice and service to the nation. For Sandy Terwiske, keeping alive the memory of her son Lance Corporal Alec Terwiske is so important. Making sure her son is never forgotten is exactly what Indiana Senator Todd Young promised her when she first gave him that special bracelet. “But when you wear it, I said, always remember the fallen, remember Alec, and all the fallen, and all of the military and all of our veterans that sacrificed, and what that means,” Sandy told him. The senator wore the bracelet every day until the State of the Union, when Sandy texted him asking to share her gratitude with the President. But Senator Young fulfilled his promise, giving the President the bracelet on live television with the whole country watching. This is the first time Sandy has reunited with the senator since the President received the bracelet. Now he’s no longer just a senator to Sandy–he’s family. Young’s quest to honor the sacrifice of Lance Corporal Alec Terwiske hasn’t ended with giving an engraving to the President. The senator wants to see the name of Sandy’s son not just on a bracelet, but on a building.